You might not (yet!) be familiar with the name Summer Swee-Singh, but I don’t think that will be true for very long. 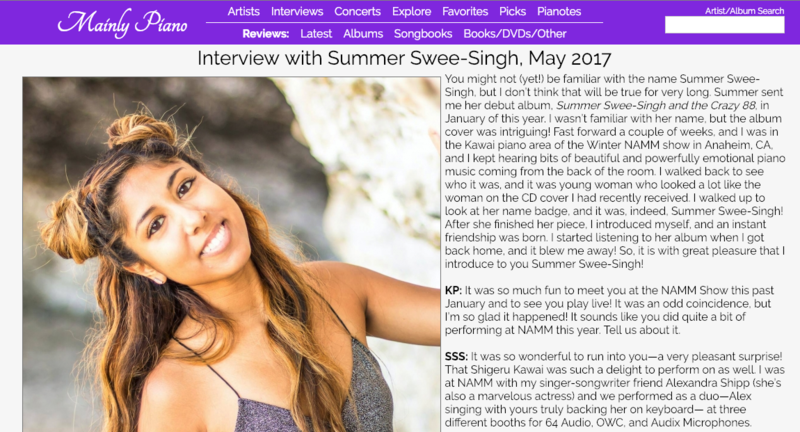 Summer sent me her debut album, Summer Swee-Singh and the Crazy 88, in January of this year. I wasn’t familiar with her name, but the album cover was intriguing! Fast forward a couple of weeks, and I was in the Kawai piano area of the Winter NAMM show in Anaheim, CA, and I kept hearing bits of beautiful and powerfully emotional piano music coming from the back of the room. I walked back to see who it was, and it was young woman who looked a lot like the woman on the CD cover I had recently received. I walked up to look at her name badge, and it was, indeed, Summer Swee-Singh! After she finished her piece, I introduced myself, and an instant friendship was born. I started listening to her album when I got back home, and it blew me away! So, it is with great pleasure that I introduce to you Summer Swee-Singh!